Below, the first coconut pie recipe has become one of my favorite cream pies over the years. 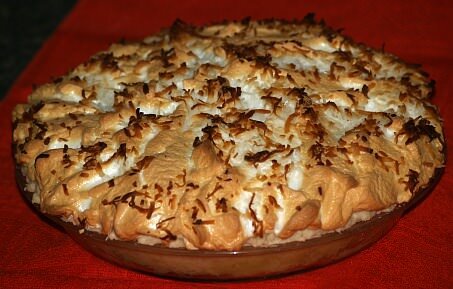 For extra special flavor use freshly grated coconut in this coconut pie recipe. When I first learned how to make a pie, coconut was not any of my favored ingredients. Over the years I developed a taste for it until it has become one of my favorite flavors. After I tasted fresh coconut, I realized I had not lived until I tasted this fresh flavor. When I first tried to tackle cracking a fresh coconut, I never dreamed it could be so hard. I had to seek out help learning how to crack a coconut; I found it wasn’t so hard after all. Hold the coconut in one hand and focus on the “face” of the coconut. All coconuts have two eyes with one of three seams running between them. The point of the three seams forms a “nose” and a “mouth” below the nose. The “eyes” are shell hard and the “mouth” is the softest part which could be punctured to drain the coconut liquid. Combine sugar, cornstarch and salt in a heavy saucepan. Cook over medium heat, stirring constantly until mixture comes to a boil and thickens; cook for 1 minute longer. Remove from the heat and stir ½ of the hot mixture into the beaten egg yolks. Pour the egg yolk mixture back into the saucepan with remaining hot milk mixture. Stir and boil for 1 more minute. Remove from the heat and blend in the butter, vanilla and coconut. Pour into a baked pie crust. Top with a meringue recipe and sprinkle with coconut before baking to a light brown. Let set to cold before cutting. Combine whites with cream of tartar in large mixing bowl; beat on high speed until foamy. Add sugar 1 tablespoon at a time beating until stiff peaks form and sugar dissolves about 4 minutes. Beat in vanilla; spread over hot filling and bake until lightly browned. This coconut pie recipe blends with a pineapple pie recipe to give the taste of a dessert tropical dessert. Mix sugar, flour and cornmeal together; add butter, eggs, pineapple and coconut and mix well. Pour mixture into pie shell and bake 30 to 40 minutes or until inserted knife point comes out clean. Let set until cool and serve with whipped cream. This coconut pie recipe with raisins is for two pies; special for when having company. Melt butter; add remaining ingredients and blend well. Pour into pie shells and bake about 1 hour. 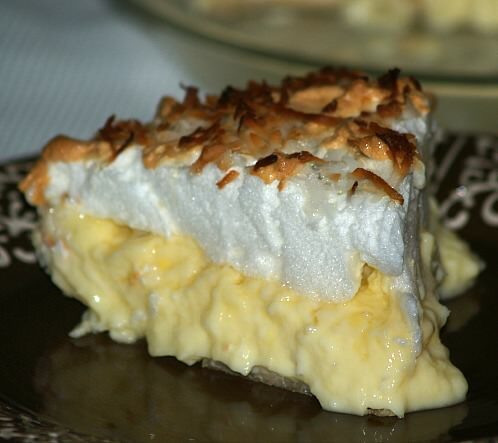 The following coconut pie recipe is also very delicious but the orange adds a twist to the traditional coconut cream pie and could very easily be considered a coconut dessert. To toast the coconut for the pie, spread the coconut on a cookie sheet and bake in an oven at 375F degrees for five minutes or until lightly browned. In a medium saucepan combine the sugar and cornstarch and mix well. Stir in the water, orange juice, butter, orange peel and egg yolks. Cook over medium heat until mixture boils and thickens, stirring constantly. Pour mixture into a bowl, cover with plastic wrap and refrigerate about 1 hour to cool. When cool, blend in the ½ cup toasted coconut and sour cream. Spoon into cooled pie crust. Beat the ½ cup whipping cream and powdered sugar until stiff peaks form. Spread over the pie filling and sprinkle with the coconut and almonds. Learn how to make a coconut pie recipe with the added flavor of pineapple and banana. Combine sugar, cornstarch, salt and coconut in heavy saucepan. Add milk and stir constantly over medium heat until thickened. Pour a little of the hot mixture into egg yolks; pour back into saucepan. Continue stirring over medium heat until thick;. Stir pineapple and vanilla into mixture; remove from heat and cool to room temperature. Stir in banana slices; pour into prebaked pie shell. Top with whipped cream and toasted coconut; garnish with nuts. Learn how to make coconut pie recipe by baking the crust with the filling. Combine butter, eggs, flour, sugar, pineapple and coconut; blend well. Pour into unbaked pie shell; bake 1 hour or until set and browned on top. In a large bowl combine milk, sugar, coconut, eggs, flour, butter and vanilla; pour into pie shell. Bake for 50 minutes or until knife inserted near the center comes out clean. In mixing bowl combine and mix flour, water and oil with a fork; shape into a ball. Divide dough into 2 parts; roll each between 2 pieces of wax paper. Press each rolled piece in the bottoms of 2 nine inch pie tins; bake 12 to 15 minutes. In medium saucepan combine sugar and cornstarch; gradually stir in the milk. Cook mixture over low heat until thickened stirring constantly. Remove from heat; stir in coconut; fold in beaten egg whites. Divide mixture evenly between 2 baked pie crust; cool before serving. Makes 2 pies; about 16 servings. Combine sugar, cornstarch and salt in a medium saucepan; stir in milk. Cook and stir constantly over medium heat until thickened and bubbly. REDUCE HEAT to low; continue stirring and cooking for 2 additional minutes. Whisk a small amount of hot mixture into beaten egg yolks; return yolk mixture to pan. Whisk constantly bringing mixture to a gentle boil; cook and stir 2 minutes. REMOVE FROM HEAT; gently stir in coconut, butter and vanilla until butter melts. Let stand and prepare meringue. TO PREPARE MERINGUE beat egg whites and cream of tartar on medium speed until foamy. Gradually add 1 tablespoon of sugar at a time beating on HIGH speed until sugar is dissolved and peaks are stiff. TO ASSEMBLE PIE pour hot filling into baked pie shell. Spread meringue over top of filling touching the crust to seal. Bake 12 to 15 minutes until meringue is golden brown. Remove from oven and cool to room temperature; refrigerate at least 3 hours before serving. Wisk together sugar, eggs, corn syrup, whipping cream, melted butter and vanilla. Stir in coconut and macadamia nuts; pour into prepared pan. Bake 55 to 60 minutes; cool on rack and garnish. This coconut pie recipe is the perfect mix of coconut and white chocolate. TO MAKE CRUST combine 1 cup coconut, crushed crackers and melted butter. Press mixture in bottom and sides of 9 inch pie plate; bake crust 10 minutes and cool. TO MAKE FILLING heat milk and 1 cup coconut in a large heavy saucepan just to a simmer stirring occasionally. Combine egg yolks, sugar and flour in a mixing bowl; beat on medium speed until blended. Gradually stir in 1 cup of the hot mixture into the yolk mixture; immediately stir yolk mixture into the saucepan. Cook and stir until mixture comes to a boil; cook and stir 2 minutes longer. Remove saucepan from heat; stir in 1 tablespoon of butter and 2 tablespoons of crème de cacao. Cover surface with plastic wrap; set aside to cool. TO MAKE CRUST COATING melt white chocolate with 1 tablespoon of butter in small saucepan over low heat. Spread white chocolate mixture over bottom and on sides of cooled crust; cool until chocolate is firm. Pour FILLING into crust; cover and chill 2 to 4 hours. TO MAKE TOPPING beat whipping cream, powdered sugar and 1 tablespoon of crème de cacao until stiff. Pile whipped cream over pie filling; cover and chill 30 minutes. Garnish with toasted coconut and white chocolate curls; serves 8.